Four runners at two venues for Ballymore Stables on Wednesday at Sandown and Terang. Falling Waters, Pedro Ximenez and Lilymorn are at the Sandown twilight meeting while Louisville Lip debuts at Terang. 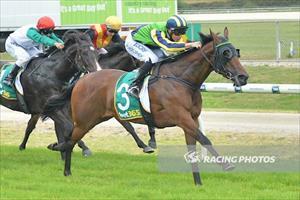 Pedro Ximenez is attempting to make it consecutive wins after winning at Werribee on January 13 when he runs in race five, the Benchmark 64 Handicap over 2400m where he will be ridden by Patrick Moloney. Mike Moroney said the conditions of the race should suit the son of High Chaparral. “His work leading into this race has been very good he will appreciate the give in the track,” Moroney said. Falling Waters (pictured) runs in race two, the Polytrack 3YO Handicap (1000m) where she will be ridden by Patrick Moloney and jump from barrier one. The daughter of Turffontein finished fourth at Caulfield at her last start and Moroney is expecting another forward showing. “She’s racing well and although it’s only a small field on Wednesday there does look some depth to it,” Moroney said. Lilymorn runs in race six, the Fillies & Mares Benchmark 78 Handicap over 1800m and to be ridden by Patrick Moloney. “We gave her a short break after her last start and she looks in great order,” Moroney said. “We can't fault her work leading and from barrier three she should be able to get the run of the race. Louisville Lip heads to Terang for his race day debut where he runs in race two, the Maiden Plate over 1400m and to be ridden by Jason Benbow. The son of Ocean Park has been well prepared with jumpouts at Flemington and Moroney is pleased to get the gelding started. “He’s pleased me with his jumpouts and has worked well leading into this run,” Moroney said. “He has shown us that he will be better as the distances get further, but this is a nice starting point.